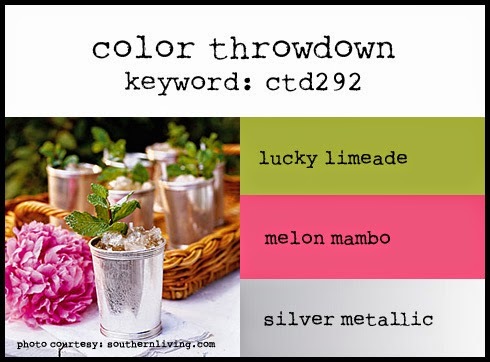 Which fits right in with this week's Color Throwdown colors brought to us by Broni. I was going with the beach, sun, sand, thing but, ended up playing with some PTI stamps and dies instead. 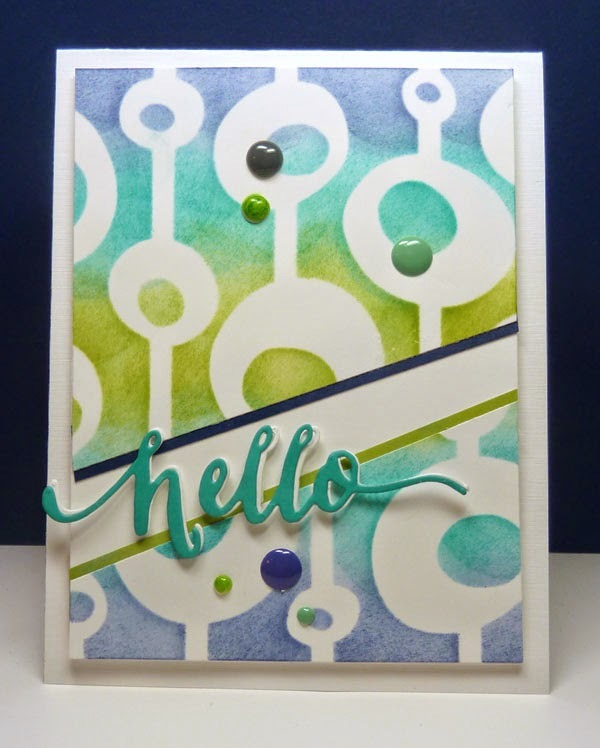 The "circles" were stamped in the requisite colors, sprayed with water, and then stamped on the cardstock. The colors are a little dark in this pic. Sentiment is from Wet Paint III. 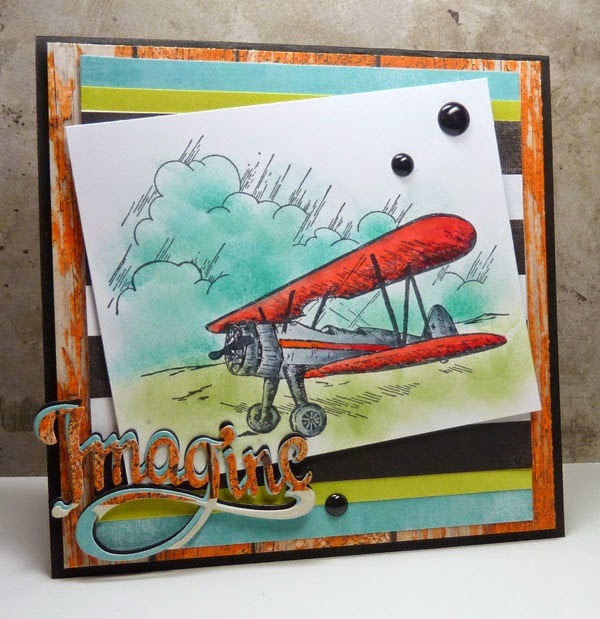 Our Guest Star Stamper this week is Christy Stanford at Snapdragonstamps. CASE Study Challenge 192--- Drink Up!! Ha.. that's sunshine and lemonade!! Well, I love the sunshine and one of my fav spring/summer drinks is lemonade... made with lemons.... and shaken! Wida Miller is the MUSE this month at the CASE Study Challenge and her card is a collage of elements. I went for the same using some die cuts from the Fresh Cut line by Basic Grey (with bright colors). Don't you just love the blended color on the acetate photo frame... fun! For the background I used a MFT MPD petal stencil with modeling paste and yellow acrylic paint. 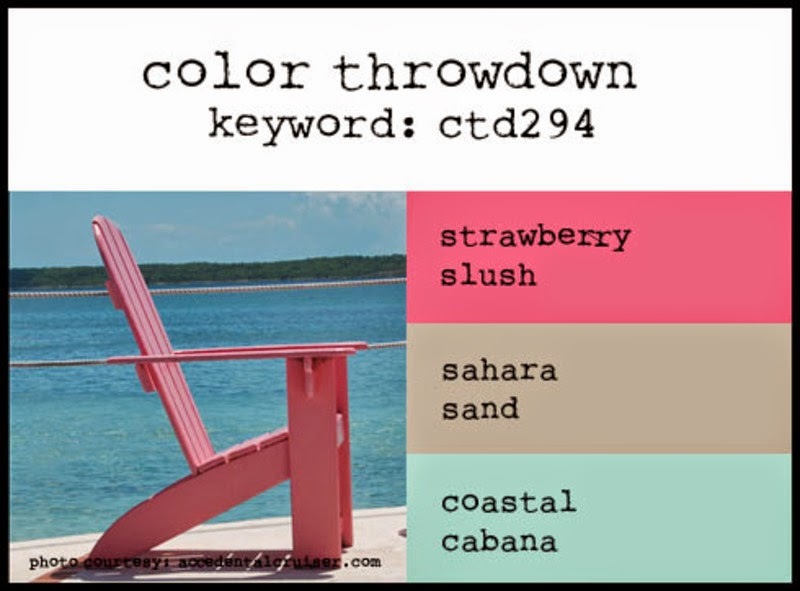 Color Throwdown #293- Hey Foxy! Oh, I had fun playing with these colors!! 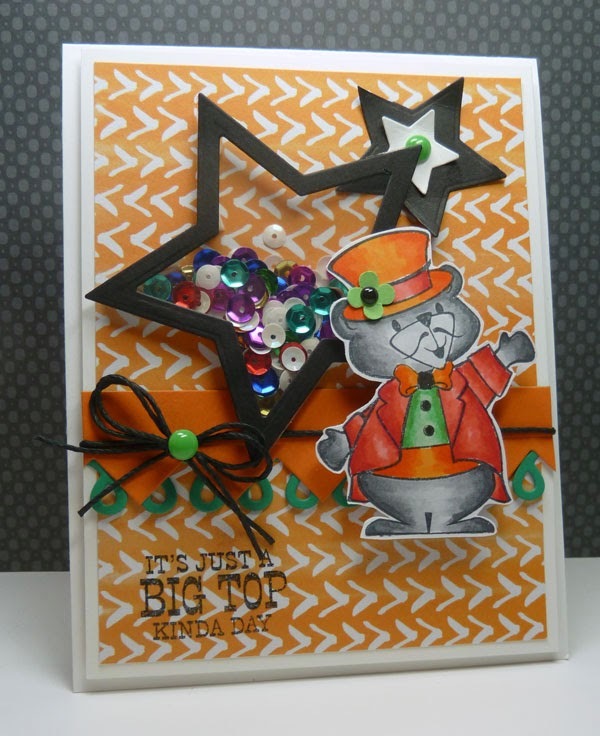 Our guest star stamper this week is Jo Hooper and you can find her blog here﻿! So excited to have you join us this week! Remember, if you don't have the exact colors, use whatever you have that's close...the color police won't come after you--this is all about having fun! If you upload to a public gallery, please use the key words CTD293. Also, when linking up your card using the linky tool at the bottom of the post, please link to your specific post, not a generic link to your blog. 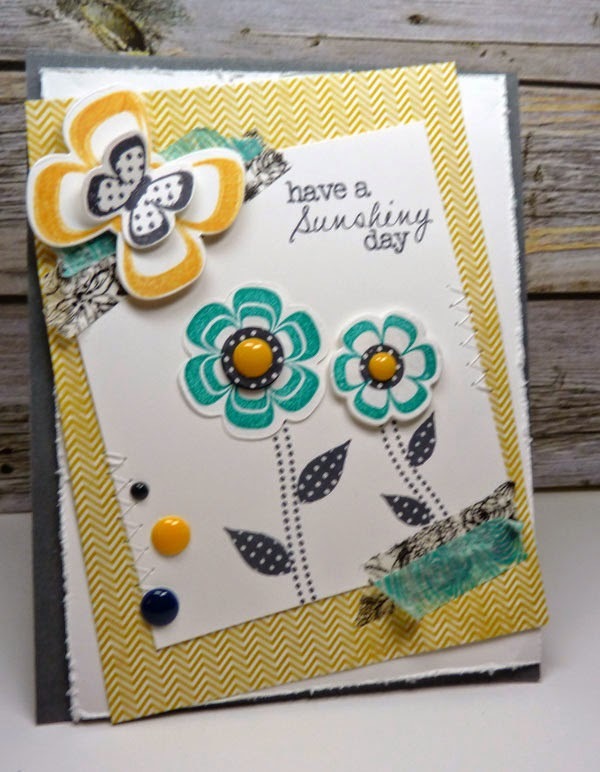 Serendipity Stamps Challenge #31 --- Flowers! Good Morning!! I have two posts today. 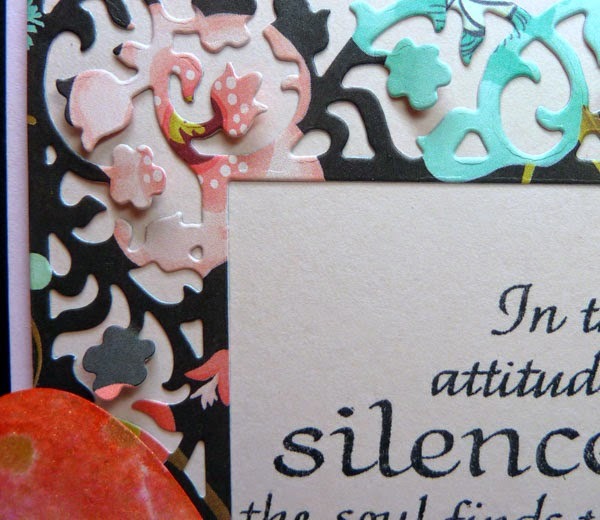 This one is for May's Serendipity Stamps Challenge.... it's all about flowers- stamped, die cut, paper, dried etc. See link below to get all the details about how you can play along and win some $ towards Serendipity stamps or dies! 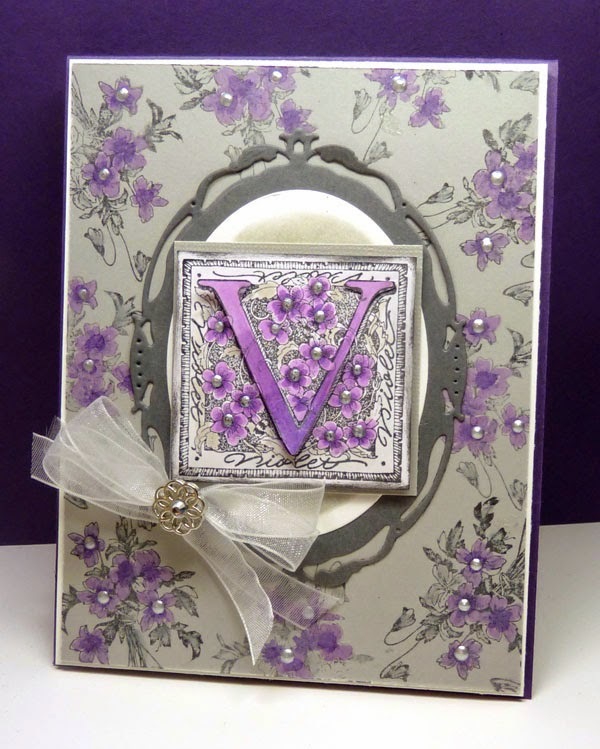 Mary has just released some fabulous word dies (you'll see one below) and a gorgeous floral frame. This time the DT were challenged to use flowers along with a resist technique. 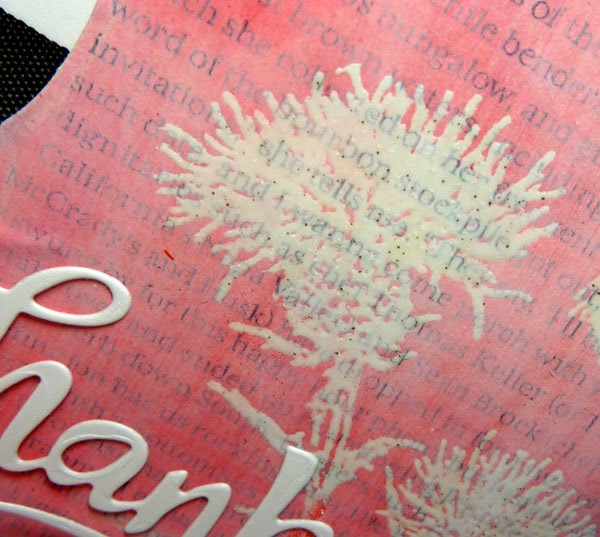 I chose to use a Gesso Resist technique... you can find the tutorial on Splitcoaststampers here. This was a new adventure for me. I applied gesso onto a magazine page until it was opaque, let it dry, stamped the solid image with versamark and heat embossed with clear embossing powder. Then you start sponging ink. The tutorial advises to start with the lighter colors and blend to dark. Not sure if I applied my gesso too thick but, when I applied the lighter ink... my image wasn't showing up... so I immediately went to a darker pink and it worked. I probably could use a better camera... IRL the image is very clearly detailed and you can see the magazine print clearly. And... the sale.....This week’s sale is Buy 3, Get the 4th Free. The rules are simple... play along using at least one Serendipity Stamps image on your submission and add a flower. You don't have to have a blog to play along - you can link your designs to any on line gallery. Curtain Call and The Cats Pajamas! Will do the details tomorrow.. my oldest daughter and I canned 36 jars of strawberry jam/jelly today. Was actually fairly quick... first time, but, taste test was awesome!! Hoping you had a fabulous WE!! 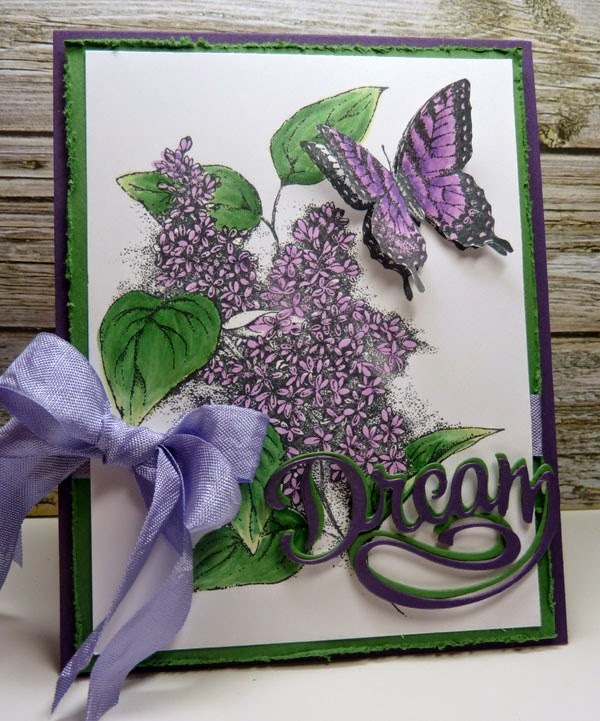 Serendipity Stamps Blog Hop... It's All About DIES!! 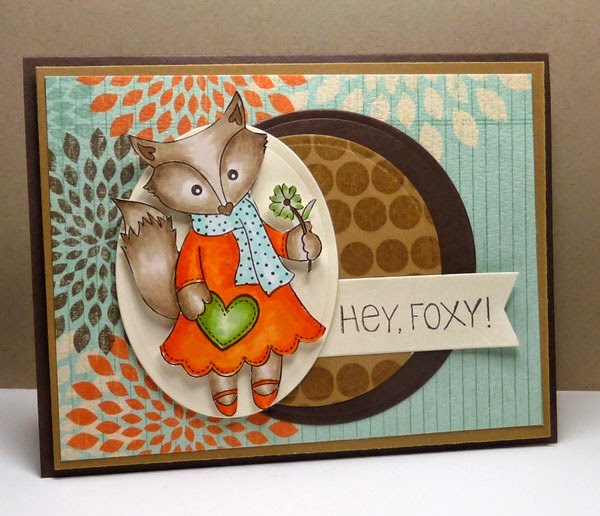 Yes, Serendipity Stamps is having a blog hop... WHY...NEW DIES! 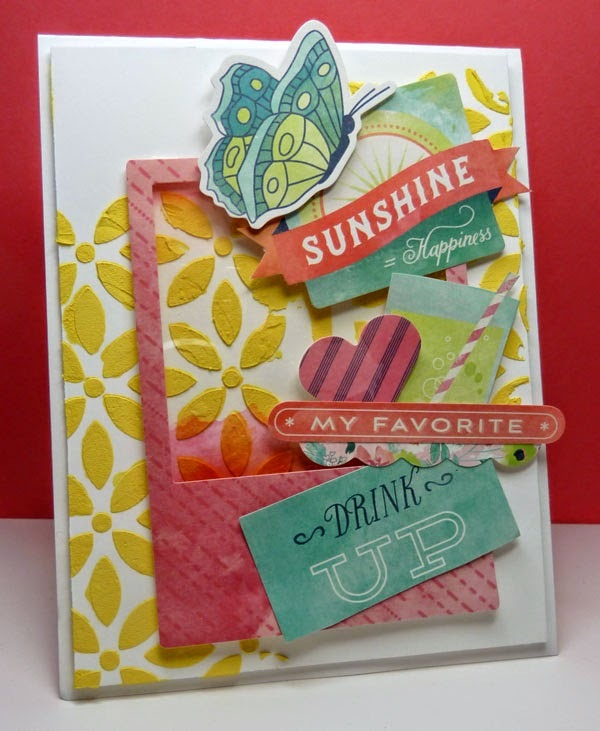 We are showcasing word dies being released today... all of the new dies make me smile! Mary is releasing 9 new word dies AND there is a Fabulous Floral Frame- with some other goodies "tucked in"!! Make sure to visit all of the DT blogs listed below so you can see all the new dies. There were so many... so the DT are providing samples using all of them. I've had so much fun playing... haven't even scratched the surface... OH, the possibilities!! This card uses an image that I fell in love with after my teamies posted some cards with it. Guess that plane should be shooting upward... instead of down... OOPS! BUT, could you IMAGINE being able to fly your own small plane... what an accomplishment! Imagine... I die cut the sentiment three times using different cardstock/patterned paper to make it stand out a little. How gorgeous is this frame!! The frame was die cut with some MME paper and mounted on SU Blushing Bride. 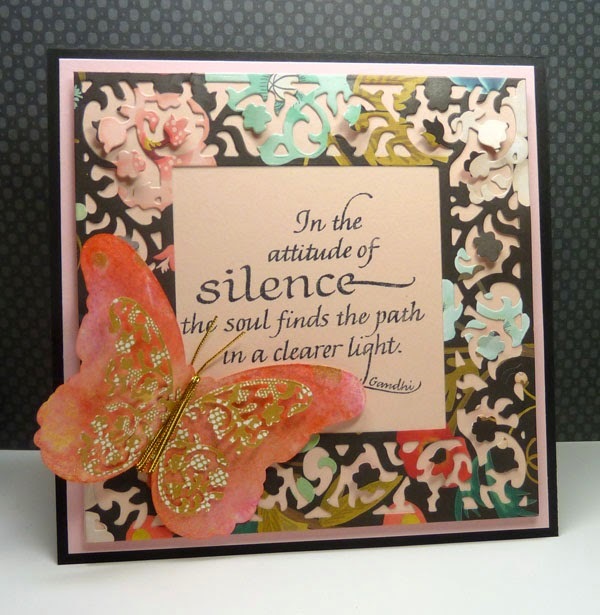 The large butterfly die is Serendipity's Solid Butterfly die ... die cut with watercolor paper. added ink to an acrylic block, placed the new die cut butterfly from the Floral Frame and Embellishment dies on top... rubbed with my fingers to pick up color and it wasn't even so I sponged on a lighter pink, and added gold spritz!! A little close up... wanted you to see the intricate detail in this frame. Gorgeous!! Here's the blog hop order... Next stop is Anya... click on the link below. $20 gift code to one person who has commented on ALL the blogs. To enter to win leave a comment you need to comment/ leave a little love on all the DT blogs. You have until midnight Sunday 5-18. Winner will be posted on Mary's blog Monday 5-19. Color Throwdown # 292- Happy Birthday!! Good Morning!! 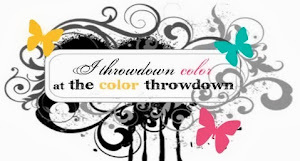 Welcome to the Color Throwdown challenge #292. The colors this week were picked by yousr truly. I am in a spring mood... it's warm and the flowers are blooming. Hope you enjoy them and have fun! 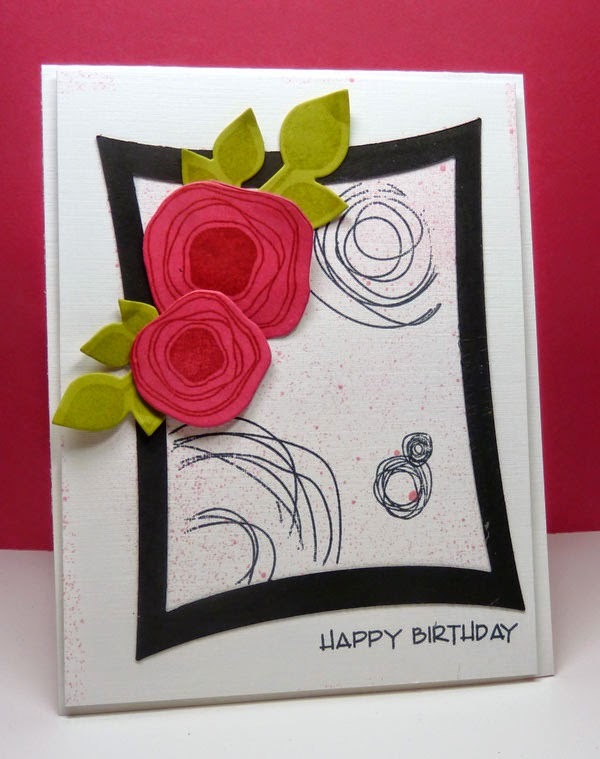 Playing with patterned paper... and MFT's Hybrid Heirloom Rose Die-namics. We also have a new, talented stamper guesting this month - Annette Allen from My Clever Creations! Our guest star stamper this week is Susie Moore at. The Dies Have It﻿! So excited to have you join us this week! 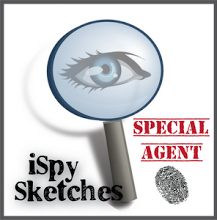 Don't forget to stop by and visit the other team members' blogs. Remember, if you don't have the exact colors, use whatever you have that's close...the color police won't come after you--this is all about having fun! If you upload to a public gallery, please use the key words CTD292. Also, when linking up your card using the linky tool at the bottom of the post, please link to your specific post, not a generic link to your blog. Soo. Happy Sunday... Happy Mother's Day!! Bill had a birthday this week and with Mother's Day- we went to lunch yesterday.. youngest was working all day today. I had a chance to play a bit today...it was my wish not to have to run around. Doesn't mean I haven't been busy.... just a few extra minutes! 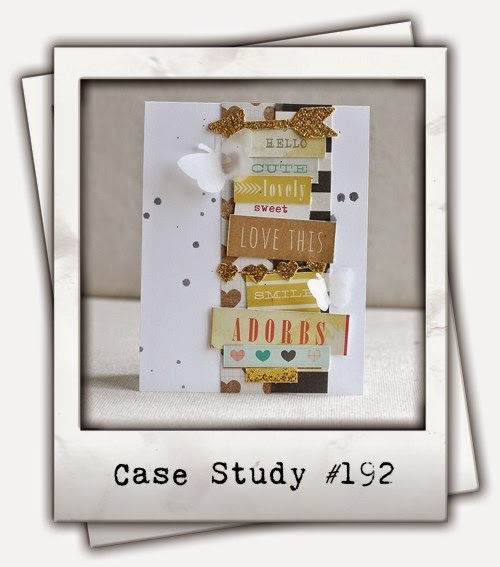 The MUSE this month at the CASE study challenge is Wida... love, love her creations. 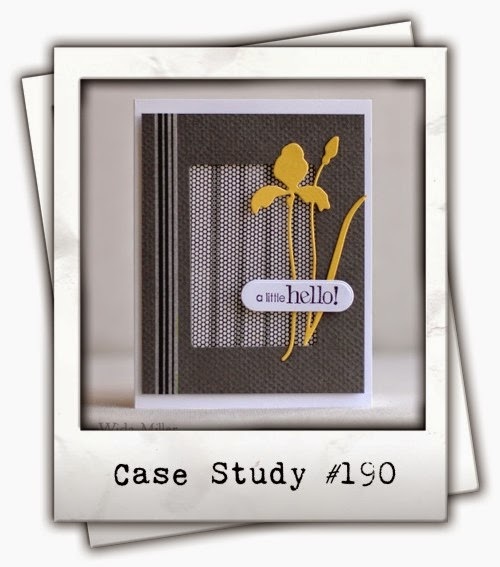 I used PTI Circle Scribbles and Verve's Poppy stamps/coordinating dies and Verve's Bloom & Grow/dies for the leaves. Sprayed with some Heidi Swapp mist. 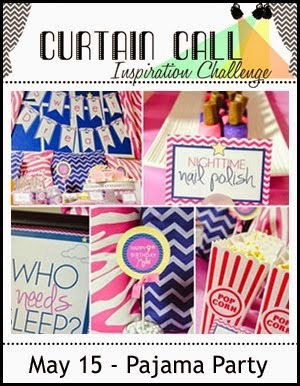 Hey, hey, hey.... it's time for the next Color Throwdown challenge. Our colors are brought to us by my sweet friend Wanda (soon to be a new grandma!!) . Still playing the retro thing... a new stencil... well, I have had it for a while and have been itching to use it... Isn't that stencil fun!! From Simon Says Stamp. Laid the stencil onto white cardstock and sponged with ink. Die cut the inked panel on a slightly slanted diagonal, die cut the WPlus9 sentiment twice, offset and popped up for a little dimension. Added a few enamel dots. We have some exciting news to announce! 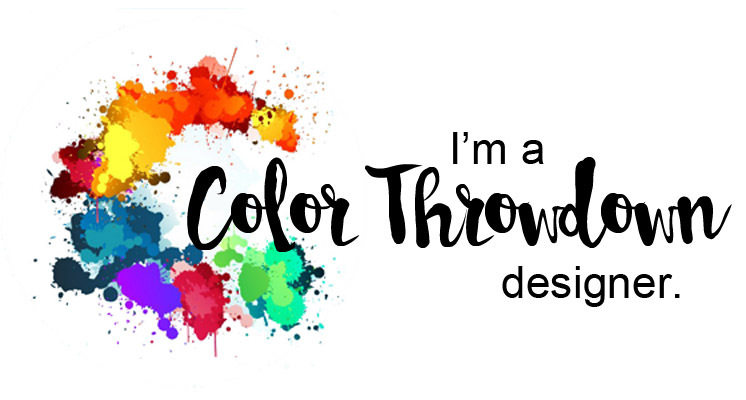 We have a new design team member...drum roll please...and a big welcome to the ultra-talented CINDY LAWRENCE from The Creative Closet! So happy to have Cindy joining us! 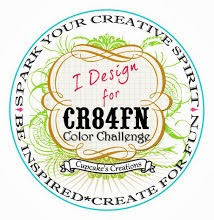 She has some fabulous coloring skills, so be sure and stop by her blog and say hello! We also have a new, talented stamper guesting this month - Annette Allen from My Clever Creations! Welcome, Annette! Our guest star stamper this week is Roberta Morin, so be sure and check out her gallery HERE ! Congrats, Roberta! Remember, if you don't have the exact colors, use whatever you have that's close...the color police won't come after you--this is all about having fun! 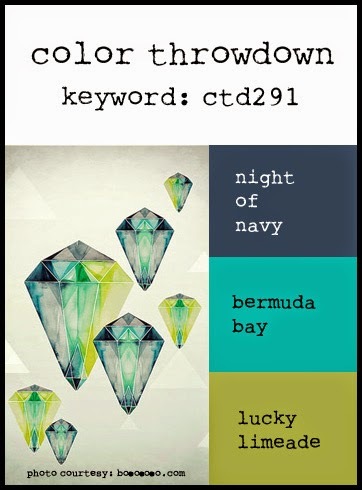 If you upload to a public gallery, please use the key words CTD291. Also, when linking up your card using the linky tool at the bottom of the post, please link to your specific post, not a generic link to your blog. 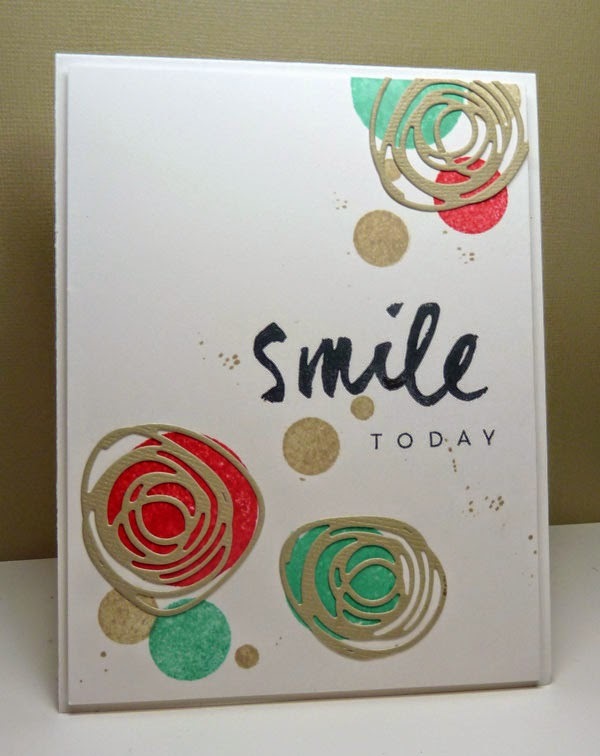 Mine is 5 things total... cardstock, ink, die cut, enamel dots, and a stencil... WOOT WOOT!! 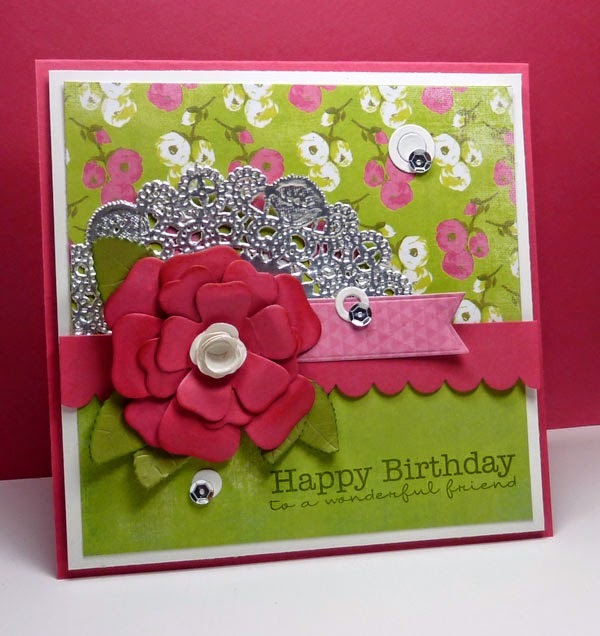 SSCB #31- it's about Flowers!! Good Morning!! I have two posts today. This one is for the start of May's Serendipity Stamps Challenge.... it's all about flowers- stamped, die cut, paper, dried etc. 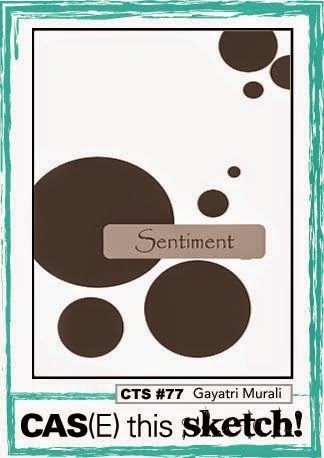 See link below to get all the details about how you can play along and win some $ towards Serendipity stamps!!! Oh... current sale 20% off the Alphabet category!! Click HERE to go shopping!! Verve Diva Dare and VLV Sketch- Butterflies and Flowers!! Flowers and butterfly are a compilation of some oldies but, goodies from Verve. Honestly, I'm loving the new sets.... best of both worlds and new dies to match! Used this week's Viva la Verve sketch and played in the Diva Dare... add a flower and butterfly!